Here's a new Crochetology challenge. I know a lot of crocheters love 'hacking' or ' deciphering' a pattern based on a photograph of a finished object. Often, the latest celebrity fashions or runway crochet fashions are the target of such hacks. Here's a simple garment I'd like to offer for you to decipher. However it is not celebrity fashion (although I have done it, I actually prefer not to do any reverse engineering of celebrity fashion or celebrity designer items). It is a simple granny square, a very traditional one, which I have used to make a pair of shorts. Let me know if you can figure it out! Then later, come up with your own designs! Have fun! Here's an update on the Crochetology hack challenge. We started with granny squares joined together. Those are just half the challenge because granny squares are easy and you can find lots of tutorials and patterns. One of the nice ones I've seen is this series. Granny squares are great because they are a clever pattern, easy to make and easy to adapt to various designs. With the granny squares joined together, we have two large rectangles made. Here the large pieces are in two different colours, very impressive colours, so you can see how they join together to make up the shorts. And here's the Crochetology.net challenge update: can you think of a simple construction method for a pair of shorts like these? What are the advantages and limits of this construction? What modification can be made to make better designs, comfortable fit and new styles? Take a look at shorts and trousers you have at home. How are they constructed? If like me, you've never done any cutting and sewing of shorts and trousers, the construction of these garments can be quite a mystery. 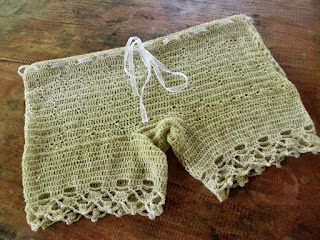 So I looked at sewing patterns, as well as cut up an old pair of shorts as guide, and made my first crocheted knickers. This is worked in lace weight silk-camel yarn and was quite complicated. It is made up of four separate parts sewn together. So the finished knickers is seamed along the inside and outside of the legs, as well as along the crotch from front to back. Then afterwards, I wanted to come up with something simpler. 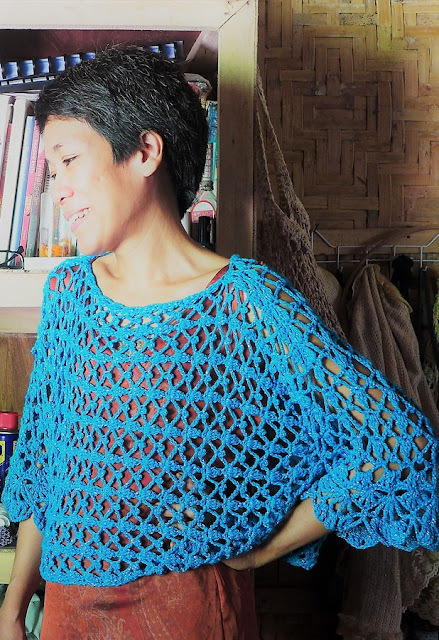 This is one example that is made in the round at the waist down, then the crotch, like a gusset, is made, joining from front to back, and finally the legs are crocheted all around the leg openings. But I want an even simpler construction method. So far, this pair of wrap shorts is one of the simpler ones I've made. The construction itself is partly derived from a pair of Indonesian batik wrap shorts that resemble the style of the dhoti that is wrapped around the waist and the bottom pulled up between the legs. It is a very old clever garment design in many Asian cultures. What Is Meant by Hacking?